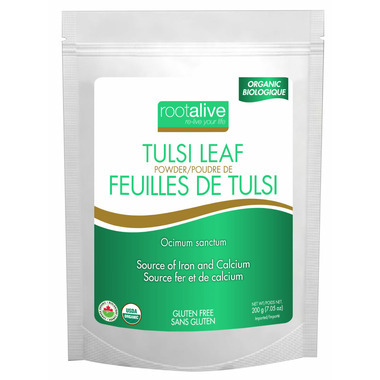 Tulsi, also known as Holy Basil, has been revered for its medicinal value for thousands of years. Ayurvedic texts describe Tulsi as a pillar of holistic herbal medicine. It is one of the most sacred herbs recognized for it’s spiritually uplifting and healing properties. Suggested use (Adults): Mix 1 teaspoon with at least 8oz. of water, juice or your favourite beverage. Cautions and Warnings: Always consult a health care practitioner prior to use if you have any health condition or are taking any medications. This is really good for me, so regardless of flavor, I would recommend it. However, the taste is great; it has a spicy kick to it. The only drawback is that it doesn't mix with liquid very well at all. If I was a smoothie maker/drinker, I could see that being the best thing to mix it into. I love this product! It's nutritious and delicious! I use this in my evening tea for the benefits of its neutrients. Go great with a green tea, with mint, and ginger.